Free space optical communications is now established as a viable approach for addressing the emerging broadband access market and its “last mile” bottleneck.. These robust systems, which establish communication links by transmitting laser beams directly through the atmosphere, have matured to the point that mass-produced models are now available. 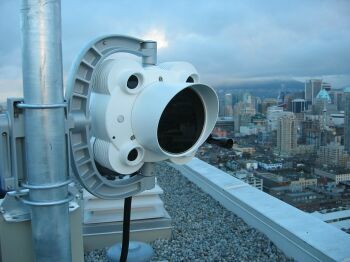 Optical wireless systems offer many features, principal among them being low start-up and operational costs, rapid deployment, and high fiber-like bandwidths. These systems are compatible with a wide range of applications and markets, and they are sufficiently flexible as to be easily implemented using a variety of different architectures. Because of these features, market projections indicate healthy growth for optical wireless sales. Although simple to deploy, optical wireless transceivers are sophisticated devices. Currently available Free Space Optics (FSO) hardware can be classified into two categories depending on the operating wavelength – systems that operate near 800 nm and those that operate near 1550 nm. There are compelling reasons for selecting 1550 nm Free Space Optics (FSO) systems due to laser eye safety, reduced solar background radiation, and compatibility with existing technology infrastructure. Laser beams with wavelengths in the range of 400 to 1400 nm emit light that passes through the cornea and lens and is focused onto a tiny spot on the retina while wavelengths above 1400 nm are absorbed by the cornea and lens, and do not focus onto the retina, as illustrated in Figure 1. It is possible to design eye-safe laser transmitters at both the 800 nm and 1550 nm wavelengths but the allowable safe laser power is about fifty times higher at 1550 nm. This factor of fifty is important as it provides up to 17 dB additional margin, allowing the system to propagate over longer distances, through heavier attenuation, and to support higher data rates. Carrier-class Free Space Optics (FSO) systems must be designed to accommodate heavy atmospheric attenuation, particularly by fog. Although longer wavelengths are favored in haze and light fog, under conditions of very low visibility this long-wavelength advantage does not apply. However, the fact that 1550 nm-based systems are allowed to transmit up to 50 times more eye-safe power will translate into superior penetration of fog or any other atmospheric attenuator. Types of optical detectors used in FSO equipment come in two flavors: PIN and APD. The PIN detector is a lower cost detector that has no internal gain, while the APD is a more expensive but also more sensitive detector with internal gain. The Benefits of using APD over PIN technology will vary, but real-world results indicate the benefits to be an improvement in sensitivity of approximately 4x that of a PIN detector. Although at first glance it would seem that systems using APD detectors should have a performance advantage; however, the performance of a system must also take into consideration the transmit characteristics. As an example, the SONAbeam155-M uses the lower-cost PIN detectors but because it produces 20-40 times the laser power of competing systems the SONAbeam155-M is still 5-10 times more effective than those systems utilizing APD based receivers. Thus, the SONAbeam is a much more powerful system, which allows it to outperform other products at the same distance, under the same weather conditions. The size of the receiver optics is also important; a larger area receive optic contributes to reducing errors due to scintallation. Scintillation is atmospheric turbulence due to solar loading and natural convection, causing temporally and spatially varying refractive index changes in the air. As a laser beam propagates through the atmosphere, there is a time-varying intensity at the receiver due to this phenomenon; this is referred to as 'scintillation'. This is quite similar to the apparent twinkling of the stars or distant city lights, which is due to the same effect. The result is that an FSO communications receiver can experience error bursts due to surges and fades in the receive signal strength. One way to combat this scintillation effect, and thus improve the error-rate performance, is to use a large aperture receiver. A collecting aperture that is much larger than the spatial scale of the scintillation provides an averaging effect of the localized surges and fades, thus improving the error rate. This large-aperture approach is more effective for scintillation reduction than multiple smaller apertures, which perform less averaging at each lens. Another way to mitigate the effects of scintillation is to use multiple transmitters, each of which takes a slightly different path through the atmosphere, which also contributes an averaging effect. The net result is that a properly designed system can defeat scintillation impairments. The operating wavelength of an FSO system also contributes to the performance of the receiver. It is generally true that high-quality photodiodes at both 800nm and 1550nm achieve comparable quantum efficiencies. However, longer wavelengths enjoy an advantage in the receiver due to their lower photon energies. Specifically, a 1550nm photon has half the energy of a 800nm photon. Consequently, for the same total energy (i.e. Watts of power), a beam of 1550nm light has twice the number of photons as a beam of 800nm light. This results in twice the photoelectrons (photocurrent) from the receiver photodiode. Since a certain minimum number of photoelectrons is required to detect an optical pulse, a pulse at 1550nm can be detected with ~ 3 dB less optical power. Hence, 1550nm has a fundamental 3 dB advantage over 800nm in receiver sensitivity. 1550 nm wavelength range is the most commonly specified for terrestrial fiber-based optical communications and consequently the supporting infrastructure for this wavelength (such as a wide selection of passive components, lasers, modulators, practical optical amplifiers, and receiver photodetectors) is vast and growing. High transmitted power may be achieved by using erbium doped fiber amplifiers, or by non-coherently combining multiple lower cost semiconductor lasers. Narrow transmitting beamwidth (a.k.a. high antenna gain) can be achieved on a limited basis for fixed-pointed units, with the minimum beamwidth large enough to accommodate building sway and wind loading. Much narrower beams can be achieved with an actively pointed system, which includes an angle tracker and fast steering mirror (or gimbal). Ideally the angle tracker operates on the communication beam, so no separate tracking beacon is required. Larger receiving optics captures a larger fraction of the total transmitted power, up to terminal cost, volume and weight limitations. And high receiver sensitivity can be achieved by using small, low-capacitance photodetectors, circuitry which compensates for detector capacitance, or using detectors with internal gain mechanisms, such as APDs. APD receivers can provide 5-10 dB improvement over PIN detectors, albeit with increased parts cost and a more complex high voltage bias circuit. These four parameters allow links to travel over longer distance, penetrate lower visibility fog, or both. Note that this approach is facilitated for systems operating at wavelengths > 1400 nm, because the higher allowable eye-safe powers at such wavelengths allow the transmitted beam to be significantly broadened spatially while still maintaining an adequate intensity at the receiver. Of primary importance to prospective buyers will be selecting the right system for the situation. Network Protocol – Transparent or Managed? For carriers today the issue of interoperability of systems within their multi-faceted networks made up of both legacy and next generation networks is crucial. Most Free Space Optics (FSO) systems currently available are physical layer devices that act the same way as fiber optic cables and receivers and are therefore able to work with all protocols while not being limited to any of them. There are systems on the market that incorporate ATM into the device but most designers of Free Space Optics (FSO) systems have opted for a protocol ‘transparent’ approach for both deployment flexibility and cost-reduction. Should a carrier wish to add such switching functionality to networks incorporating physical layer products there are many switches available on the market, all of which will interoperate with a physical layer device. Reliability – Built to Last? Every buyer wants to know the expected failure rate of the equipment they are investing in, for outdoor or industrial applications the ruggedness of a system becomes even more important. A system can be engineered and designed for exceptional reliability. Engineering a product for long-life includes selecting top-quality, long-life components from reliable vendors. Telecom grade components are preferred, as are low-stress electronics. The system must also be designed to maintain an optimum operating environment for the selected components and sub-systems. A rugged, environmentally-sealed housing is the first defense of a system against the elements. Appropriate heating and cooling mechanisms should be also in place in order to maintain optimum temperature and humidity within the device. In addition, a system design that incorporates a mechanism for reducing laser power during clear weather will extend the life of the laser drivers and the product itself. Active cooling of each laser will further enhance the lifespan of these relatively expensive sub-systems. If these considerations are taken into account, the system should have an impressive MTBF (mean time before failure). Will it be Available in Volume? Cost - Is the Price Right?